The F-It List was such a sweet book---and I didn't expect that, going off of the title. I really enjoyed it! I liked Alex from the very first page and found myself quite invested in her journey. ALex had a fresh, honest voice and that made for a really enjoyable read. Alex has a lot going on in her life: dealing with the death of her father, her mother coping with the loss by escaping at work, and helping raise her two younger brothers. Not to mention working at a sandwich shop after school and a new love interest (whom she tries to ignore but can't). Alex and Becca have been best friends forever, but Alex starts to avoid Becca after Becca sleeps with Alex's boyfriend. All on the night of Alex's father's funeral. Alex avoids Becca all summer, then finally decides to forgive her. When she does, she learns that Becca has cancer. Alex isn't really emotionally equipped to deal with Becca's cancer, but does the best she can to help her friend. She ends up helping Becca execute the items on her bucket list, since Becca is too ill to do most of them herself. I liked the actual list and the way it showed Becca's growth from a young girl to a teen. I liked the way Alex took the list so seriously and was so committed to finishing it for Becca. I liked the way the two friends interacted, it felt very realistic. My favorite part about this book was the change in Alex. I expected Becca to be the one who changed the most, but it was Alex's views on the world that were softened and her heart changed to let love in. 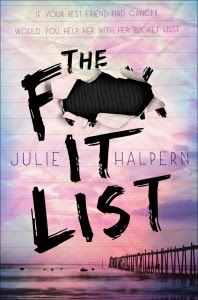 I really enjoyed The F-It List and would recommend it to fans of contemporary YA. I would definitely read Julie Halpern again!